The ten beehive-shaped masonry structures each stand about 25 feet high, have a circumference of roughly 30 feet and are a marvel to see. The complex was completed in 1877 by the Modock Consolidated Mining Company, which operated two smelters adjacent to their group of lead-silver mines approximately 25 miles away. They needed fuel to run the smelters and the Pinyon pine and Juniper covered mountains around the kilns held the answer. The kilns were capable of charring wood or organic matter into charcoal, by a process of slow burning in low oxygen. 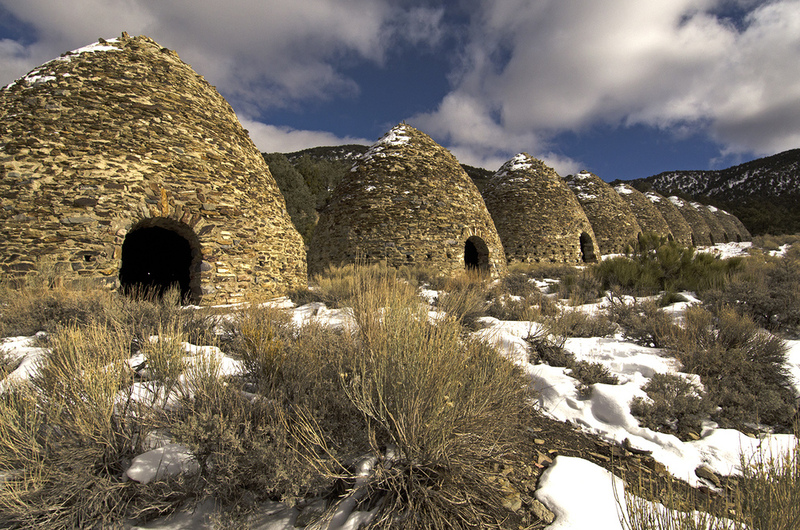 Each kiln could hold about 42 cords of wood, which produced 2,000 bushels of charcoal over a two week period. The charcoal could then be used as furnace fuel because it burned more slowly than wood and generated a much greater heat that was needed for the refining of ores. The kilns most likely ceased operation in 1879, even though the mines continued to operate intermittingly until around 1900. They may have found a better source of fuel, or my guess is, a closer one. Just driving in to get to these kilns is quite a little adventure. I can’t imagine what it would have been like over 130 years ago, driving wagons or teams of jackass pack-trains down the narrow road to the smelters 25 miles away. It would have been expensive and dangerous. All ten of the kilns are in excellent condition, possibly due to the fact that they were only used for a few years and then abandoned. Also, they’re way out in the wilds which may have helped keep them safe. I went inside most of them and they’re all basically the same. Blackened ceilings, woodsmoke smell, small holes low along the wall probably to control the flow of air, a window up high in the back, and a low curved opening in front. The stones all fit together amazingly well. It was a bit chilly when I was there and I imagine the snow can really pile up in the winter at 6,800 feet. I was lucky to catch a break in the weather and find the roads open. Definitely add the Wildrose Charcoal Kilns to your PTV (places to visit) list.